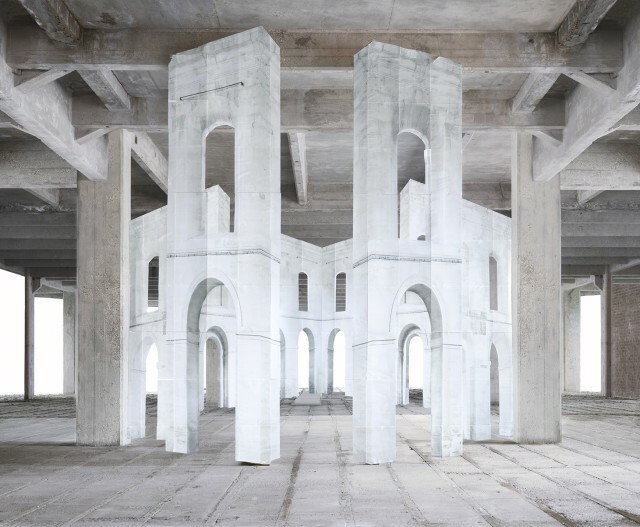 The photographs of artist Noémie Goudal are gateways into worlds of make-believe. Layering the natural and the architectural, the ancient and the contemporary, Goudal crafts solitary realms that juxtapose reality and fiction. Here, we premiere unseen works from her In Search of the First Line series, shot inside the derelict Cabinet Building in Hayes, West London. To create these haunting scenes, Goudal photographed fragments of architecture with ambiguous historic and spiritual significance, and transposed them onto the industrial backdrop of the 1911 building, designed by Wallis, Gilbert & Partners. One of a series of former factories and recording studios once owned by EMI, the structure now lies empty. We caught up with artist – represented by London gallery Edel Assanti – to find out about her affection for architecture and why it’s the perfect vehicle for her brand of storytelling. Why the interest in juxtaposing religious and industrial architecture in your series, In Search of the First Line? At the Royal College, I did my dissertation on the way we build stories into images, and how they invented new devices – during the Middle Ages, and then with the Renaissance and its laws of perspective – to present a single story in a single canvas, through layering. I was very interested in how you can use the foreground, middleground and background to create different spaces, but also show different moments in time. I wanted to work with different historical buildings without necessarily saying, ‘This building is from a specific moment in the middle-ages.’ For me, it’s about the idea of mixing different parts of history. I blur the frontiers between different moments of time in this way. What role does fiction play in your work? My work is about creating a space – offering a landscape – where the viewer can live, and can create their own fiction. I’m telling the story through these backdrop images, but you don’t need to believe it. You can see the story is not true from the folds in the paper. What draws you to the buildings you shoot? If I use a building that is completely derelict or in transition, then the viewer can project his perceptions onto the image. You can project so much onto concrete. I’m drawn to spaces that are in-between. What does the architecture become in your work. It’s the vehicle for my ideas. In Observatoires (showing at Foam gallery in May), for example, the forms themselves are not that important. The edifices themselves were made from photographs of fragments of buildings that I printed on paper and mounted onto cardboard. Somebody was behind them holding them up [as I shot them in situ]. Observatoires is about the idea of a building being in a position to observe nature, to observe the skies. The buildings have a function. I’m more interested in the concept behind them rather than the shapes themselves. How do your works talk about time and permanency? The ephemerality of the installation is very important: if I do something, it lasts for a few seconds. Afterwards, the wind comes and then water and everything is destroyed. But what remains is the picture. Visually, there are some similarities to the works of the Bechers. They photographed buildings that were very old, industrial and stable. But what I want to show is that those structures are also completely the opposite: they are ephemeral, fragile and can disappear very quickly. Noémie Goudal’s next exhibition is ‘The Geometrical Determination of the Sunrise’ at Foam gallery in Amsterdam (from 29 May to 19 July) and three of her works will be shown at the Vita Vitale show in the Azerbaijani pavilion at the Venice Biennale (from 9 May to 22 November).